Tammy Hunter entered a range in 2001 looking for a private pistol class in preparation for her CHL course. 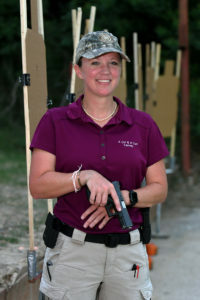 After completing the CHL course, Tammy immediately enrolled in the ranges’ weekly tactical class, and after completing that, began competing regularly in IDPA. With her children now growing up, Tammy felt the calling to teach again, but this time to instruct a different kind of student: women entering the world of gun ownership, needing instruction, and wanting to provide a new layer of security for their loved ones, and their households. The combination of her traditional teaching background, strong classroom skills, and solid foundation in firearms training were an outstanding recipe for a successful firearms instructor. When mixed with her passion to help a wave of new female gun owners, Tammy immediately set herself apart, and has never looked back. Her timing was perfect, as with the explosive growth of women gun owners, a qualified female instructor was essential to meet the growing need. That was in 2009. Teaching CHL training and beginner handgun courses, focusing on supporting women on their journey into responsible gun ownership. Volunteering at the “Northwest Houston Friends of NRA” serving as Co-chair for multiple events. Conducting monthly youth specific classes for 12-15 year olds in firearms safety and the basics of rifle and shotgun shooting. Operating a very successful chapter of “A Girl & A Gun Shooting League” Tammy facilitates three monthly events designed to get women out to shoot in a more social environment and take beginners to whatever skill level they wish to achieve, and provide experienced shooters with more opportunities. More recently Tammy has entered the world of media analysis, appearing on multiple programs discussing gun related topics and issues.